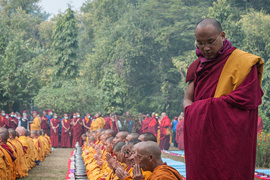 LOVING-KINDNESS AND COMPASSION play such an important role in the Buddhist approach to spirituality that we can say that a genuine practice of the Dharma is actually based on the development of these qualities. The teachings always emphasize that, unless we practice and integrate these qualities into our everyday lives, it will be utterly impossible to attain enlightenment and liberation. Moreover, without such an integration of loving-kindness and compassion, not only are we failing to benefit others, we are actually harming them, whether directly or indirectly. In the same way that water can never be used to make things dry, and fire cannot be used to make them wet, aggression and harmfulness can never cause enlightenment. Loving-kindness and compassion are also the cause of accumulating the merit to be born in the higher realms, including this human realm. If we had not practiced these qualities in the past, we would not have been born as human beings, and there would be no chance to be born into any of the higher states of experience. Therefore, loving-kindness and compassion are karmically very significant, and we should make them the core of whatever Dharma practices we do. These positive qualities should be like the life force within us, like the mind in a living being. A body without a mind, or a life force, would not be able to perform actions like a real human being. Instead, it would be only an empty reflection or effigy. In the same way, spiritual practice without the core practice of loving-kindness and compassion could only be a parody of genuine spirituality. Unenlightened beings suffer continuously from the neuroses of attachment, aggression, and ignorance. These emotional upheavals develop because of a lack of compassion, kindness, and open concern for the well-being of others. Lacking such positive attitudes and feelings, we continually indulge ourselves, developing these three mental poisons further, and thus bring added suffering and confusion to ourselves and others alike. Conversely, a person who has fully integrated loving-kindness and compassion has transcended the three poisons. For such a kind, gentle, and compassionate person, the upheaval of aggression has ceased. Gentleness and compassion cannot coexist with aggression and hatred toward others. Therefore, in treading on the Buddhist path toward the experience of enlightenment, the essential basis of development for both beginners and advanced practitioners is the practice of loving-kindness and compassion. 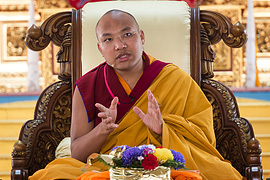 Without the basic ground of the qualities of loving-kindness and compassion, the Vajrayana would not exist. It simply would not make any sense without a genuine practice and ongoing experience of loving-kindness and compassion towards all beings. 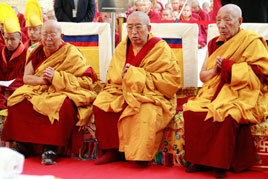 In addition, the bodhisattva vow could not be taken without a sincere commitment to generate such an attitude. The enlightened bodhisattva attitude embodies the complete letting go of oneself for the benefit and enlightenment of all sentient beings, without exception. Without this attitude, therefore, there would not be much use in taking the vow. It would be meaningless--just another label, a label that is as laughable as a blind man claiming to have good vision. Such a person would be ridiculed, or else pitied for his stupidity. 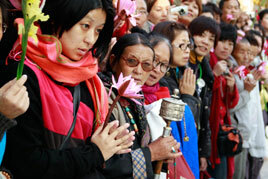 Therefore, the bodhisattva vow is to be taken with a sincere concern for the benefit of all sentient beings. Having taken the vow and developed loving-kindness and compassion, the three mental poisons are transcended because there is no room for aggression and hatred when the mind is filled with these qualities. With the realization of the importance of these two supreme qualities, and the desire to benefit all beings, great clarity and understanding develop. That clarity and understanding is itself the transcendence of ignorance, attachment, and passion--all of which arise because of the insatiable thirst for selfish attainment and success. 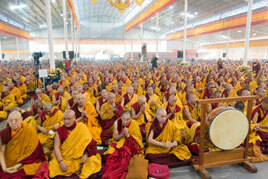 Whoever has given priority to benefiting all beings is able gradually to let go of such negative patterns. For all these reasons, a sincere and proper understanding of loving-kindness and compassion is very important. Having that understanding and an appreciation of the need to integrate these qualities into daily practice, you will experience frequent moments of leisure and calmness when you can take advantage, as a beginner, of the opportunity to practice loving-kindness and compassion. In this way, the gradual integration of these qualities comes about, so that in times of frustration, fear, and aggression, you are able to transform the situation. On the other hand, if we do not realize the practice of loving-kindness and compassion, then when the need arises--for example, when the experience of fear or aggression suddenly occurs--it will be very difficult to achieve a state of gentleness and compassion because of the intensity of our habitual mental patterns. Trying to experience a state of gentleness in those circumstances might even increase the frustration and confusion, due to the intensity of the upheaval. 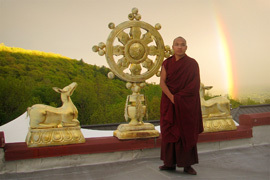 Through the noble practice of loving-kindness and compassion, we can develop a very open relationship toward all beings. Such a relationship is one of respect, based on the idea that no matter what disparities may exist between different categories of beings, such as human beings, animals, or whatever, they all have equal capacities. Thus the practitioner tries to develop equal concern for them all. The mere sight of any living being--whether tiny or huge, whether our own kind or a different species --will arouse the feeling of gentleness and kindness. This is a very powerful feeling; in fact, it is the gateway to the experience of the perfect state of enlightenment. Having developed such kindness, gentleness, and openness of mind toward all beings, it is possible to genuinely feel the needs of others. A very true and honest concern for beings develops. Then, if at times a certain being projects aggression or hatred, the gentleness and kindness we have developed will help us feel and express an even stronger sense of compassion and gentleness. 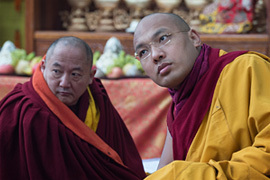 This is due to the understanding that in the past we have been caught up in the experience of samsara precisely because of the lack of such qualities of gentleness and loving-kindness. In addition, developing further aggression and ignorance in the present is only going to cause further suffering and entrapment in cyclic existence. If we cannot have a loving, kind, and compassionate attitude toward all beings, if we cannot experience tenderness and gentleness toward all beings, there is no purpose in life. 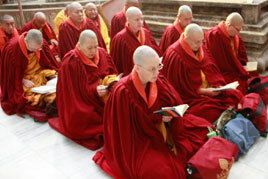 Further, there is no purpose in being connected with the Dharma. 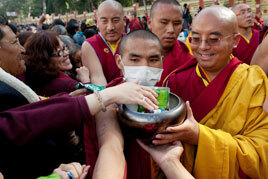 The very purpose of the Dharma is to develop and integrate the practice of loving kindness and compassion. In doing so, we not only benefit ourselves, but others at the same time. Practicing and integrating these qualities brings about the possibility of the enlightening situation of openness and an experience of ongoing happiness within this lifetime; thus, there is a tremendous need to develop these qualities. People experience depression, confusion, and frustration because they make all kinds of categorizations. When we are with certain beings who have greater success than we do, a feeling of inferiority can arise. Evaluating things from this mundane point of view can give rise to a sense of jealousy, accompanied by a desire to inflict harm. Envy can grow in our minds, causing all kinds of frustration and confusion. Another situation can arise when everyone in a particular society belongs to the same class and is on an equal level: this can give rise to feelings of competition, of wanting to dominate others or to be better than others. Such wishes usually result in failure, and once again we are overcome by anger, frustration, depression, and hatred, and all kinds of neurotic projections take place. Then there are other times when we are with people and feel they are completely incapable, or at least that they are less capable than we are. In comparing ourselves with these beings, we feel they do not have this or that ability; we feel they are somehow lacking. This gives rise to feelings of superiority, and then there is the sense of wanting to neglect or overlook such people. If we have integrated loving-kindness and compassion, no matter what type of beings we are with and must adjust to, a sense of joyfulness and happiness will be present. 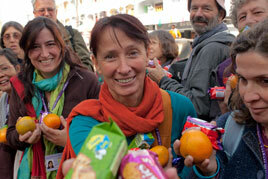 There will be openness and communication and a sense of well-being toward other people. Other people can feel this and relate to us accordingly. In the same way, if we are in a situation where everyone is basically equal, a feeling of support for each other will grow, along with the wish that these people will become more successful, more comfortable, and happier in their life situations and relationships. Thus we create a situation of openness and communication, and we are able to concern ourselves with benefiting others who are less capable by helping, supporting, and encouraging them. With that kind of relationship, everyone feels respected and trusted and can rejoice in each others' progress. There is an experience of openness, happiness, and gentleness in all kinds of relationships, such as within families, between husband and wife or parents and children, and among relatives and friends. All kinds of relationships will have these positive possibilities. In contrast, the most destructive thing in our lives, the perpetual experience of great suffering, is brought about by our own egocentric clinging to selfish and insatiable pursuits. As long as this situation exists in our lives, it is inseparable from aggression. Clinging to ourselves and devoting all efforts to ourselves continually gives rise to aggression and perpetuates samsara's endless suffering. 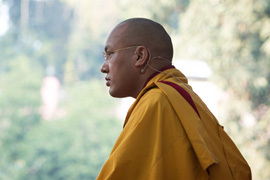 The transcendence of this suffering is possible only through the antidote of loving-kindness and compassion. Without these qualities, all kinds of destructive situations and suffering come about, because we have tremendous expectations. For example, we have expectations that we should be respected, arising from the selfish feeling that we are somehow the greatest person and, therefore, should be looked up to. We also have expectations that we should not be harmed in any way. We also have very unrealistic attitudes about others living up to our expectations. When these are not met, trouble develops between husband and wife, among relatives and between friends. Each of us believes that our wishes, our needs, and our notions of what is good must be respected by everyone else. Even though we may talk a lot about loving-kindness, inside we are still going through the same difficulties and experiencing the same suffering. If we really have a sincere experience of loving kindness and compassion toward others, we no longer need to say things like, "I have to work on my anger," "I have to work on my aggression," or "I have to work on my egotism. The feeling of loving-kindness itself liberates our egocentric notions and the other neurotic patterns that arise. It should be very clear that the experience of relative and ultimate happiness within this lifetime, as well as in future lifetimes, is dependent upon our practice and integration of loving-kindness and compassion now. A total dedication to the benefit of others is essential. This precious human birth is not obtained by chance, nor will it be obtained by chance in the future. Right now we are in the fortunate situation of being able to live happily in this life and to accumulate the seeds of future happiness. Now is the time when loving-kindness and compassion can be developed, progressively leading to more and more benefit to more and more beings. Such a possibility depends on our practice right now, within this particular lifetime. If we have no practice of loving-kindness and compassion, then even if we had the opportunity to teach a gathering of people, we might feel tremendous aggression toward that group. Such feelings of opposition or unfriendliness would lead to the desire to control others, to have power over them, which is the cause of harm and destruction. We can clearly see around us these days how such attitudes bring tremendous harm to us and to others and bring about many hopeless situations. Only the sincere development of loving-kindness and compassion can prevent or transform such situations. It enables others to live respectable and dignified lives, bringing them, as well as us, both relative and ultimate happiness. In thinking about these qualities, we also need to take into consideration the factor of karmic conditioning. When we are at the edge of a cliff, it is possible to be very careful and avoid falling off. But if we have not developed the ability to be careful and mindful, when we fall off the edge it is useless to start wishing for wings. In the same fashion, what we will experience in the future definitely depends on how we live our lives. If we practice loving-kindness and compassion sincerely and fully for the benefit of others, then in the future not even a very powerful being can prevent us from experiencing further happiness and well-being. Even if we have the notion that we really do not want to experience such happiness, it would still come about. On the other hand, if all we have done is accumulate the causes of further suffering, then at the moment when we are on the verge of experiencing such suffering and confusion, there is no chance to be wise, no chance to think twice about our past behavior. It is truly pathetic to see beings who sincerely want to experience happiness and well-being acting at the same time in ways that will bring them every imaginable kind of suffering, pain, and destruction (both physical and mental), not only in this lifetime but in lifetimes to come. This is the epitome of confusion and bewilderment. It is heartbreaking to see beings who desire happiness and well-being, who even desire the experience of liberation and enlightenment, doing the very things that totally prevent the possibility of such an experience. Such people are totally bewildered and confused. This is not to say that they are so ignorant they would not know how to eat, that they would use a hat for their feet or put their shoes on their head, but karmically it is a similar situation. As practitioners of the Dharma, we cannot ignore the state of confusion and bewilderment beings are going through. It is so obvious that we cannot ignore it. We also cannot afford to continue committing such actions of confusion and bewilderment ourselves, because the nature of the situation is so clearly obvious. It is not a myth or a legend, not a situation taking place only in far away countries like Vietnam or Cambodia. It is occurring right here and now. Everyone, in one way or another, and to a greater or lesser degree, wants to experience happiness and well-being. Instead, there is considerable bewilderment and confusion as a result of neurotic patterns. For example, we may try to obtain happiness and well-being by depriving others of their wealth, their power, their freedom, even their lives. Thus, in our confusion, we bring immense suffering both to ourselves and to others, yet everyone involved still hopes to experience happiness and well-being. What an unfortunate situation beings are in! For those in such a state of total confusion, the chance of achieving ultimate enlightenment or ultimate happiness is very slim. Therefore, as practitioners of the Dharma, we must realize the preciousness of our practice. We need to see what really causes the confusion of beings: doing the very opposite of what they should do. We should recognize that, since we ourselves are not going through such intense confusion and bewilderment, we have the opportunity to develop enlightened abilities and to relieve the confusion and bewilderment of others. There is no reason whatever not to seize this opportunity and practice with greater and greater exertion. With this commitment, the most important aspect of the practice consists of seeing the limitations beings suffer from and sincerely wishing to benefit all beings by removing these limitations and relieving their suffering. 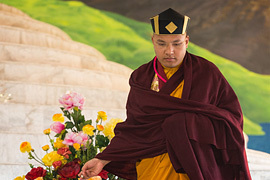 This practice involves helping beings attain complete liberation from confusion and suffering, not only from the ongoing experience of confusion and suffering, but even from the very roots of such experiences. We develop the aspiration time and time again to uproot the confusion and suffering of all beings with a sincere, honest, and genuine concern. Repeatedly, we train ourselves to be continually mindful so we will not cause harm or confusion to others, to be continually mindful of the need for a compassionate attitude toward all beings, not only when we are making a specific effort to do so, but at all times. 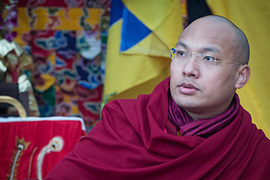 If we do the necessary practices to develop compassion and loving-kindness on a daily basis, then we will surely be able to carry these qualities out of the practice situation and into our daily lives and to maintain a continual attitude of openness toward the limitations of various beings. However, if we are not engaged in such regular practices, a surface understanding of these teachings will not help at all. This is because even a slight negative reaction from someone would bring about a negative response from us, since we have not developed compassion and loving-kindness as an integral part of our being. With this in mind, it is important to maintain the attitude of loving-kindness and compassion, as well as the desire to benefit all beings, in whatever practice we may be doing--the visualization of deities, the recitation of mantra, prostrations, or any other form of practice. Even if it is only one prostration or one mantra, you can dedicate it totally for the benefit of all beings; you can give yourself totally toward that end. Eventually, such an attitude and aspiration will begin to come about effortlessly and spontaneously. As a result, loving-kindness, gentleness, and compassion will be present all the time, like an undercurrent to whatever practice you do. When that situation occurs and that experience becomes part of practice, the practice is fruitful: it becomes a worthy practice according to the path of the enlightened ones. On the other hand, you may do all sorts of different practices, but if there is no flavor of compassion or loving-kindness in them, they will not be beneficial either to you or to others. The great Indian mahapandita Chandrakirti said that all scholars, according to tradition, first do their prostrations to a particular deity before they write about the teachings. In his case, however, he made his supplication to loving-kindness and compassion. He explained it in this way: the Buddhas and bodhisattvas are the fruition, but without compassion, which is the cause, there can not be Buddhas or bodhisattvas. Thus, he did his prostrations to loving-kindness and compassion, because the possibility of attaining Buddhahood depends on the integration of these qualities; the practice of compassion gives birth to Buddhas and bodhisattvas. At first, formal practice is very important. We might be able to actively practice loving-kindness and compassion for the liberation of all beings, but due to our limitations it will be very difficult to actually fulfill the needs of all beings. Therefore, we first need to work on self-development. 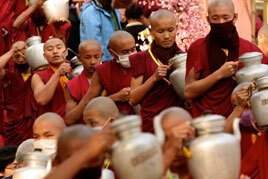 When doing practice, we must first have the attitude that we are going to do it to benefit all sentient beings. Then we must actually do it for the benefit of beings. 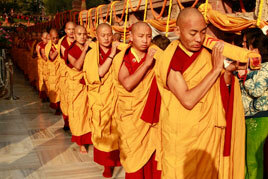 Finally, we must dedicate the merit of the practice for the benefit of all beings. These are three very important steps which must take place in order to prevent practice from becoming a selfish pursuit intended only for our own liberation. With this kind of attitude in practice, individual development will take place, including developing skill in benefiting beings as well as completely ceasing to harm beings. At this point, there may be times when we do cause harm to others, but if our sincere concern is to benefit others, and it is simply because of our limitations and ignorance that we have caused harm, the harm has not been intentional. This is, in fact, quite an encouraging step, in spite of whatever limitations we still may have. Training ourselves individually is very important, because in doing so, we begin to develop some of the qualities that are important for working with others. These qualities include appreciation, which is a source of great joy in working with others, and patience, so that even if you have to do the same thing over and over until it works, you will not get tired of it. These important qualities can be developed through the practice and whatever other activities we may do. Patience, in particular, can be developed through the practice of loving-kindness and compassion. As well as benefiting others, patience is also a key to our own sanity and the gradual attainment of enlightenment. The emotional upheaval of the three poisons takes place because of the lack of patience, which can occur in many different ways. For example, suppose you have done favors or brought about good things for others, but without a positive attitude. As a result, certain negative emotional and neurotic patterns arise, such as feeling that you are not being shown the gratitude you deserve, and becoming very impatient and frustrated. Aggression is such a destructive force! If a person's mind is filled with aggression, many other unhappy and confusing situations may also occur. Sometimes, it gets to the point that they cannot even avoid falling asleep in an angry state. In that case, they wake up feeling worn out. The sleep has not been restful at all, having slept in a very unhealthy mental state in which the dreams may have been intensely negative, even nightmarish. The antidote for aggression, whether while dreaming or while awake, is gentle loving-kindness and compassion. People sometimes have the feeling that by going to a solitary place where the environment is quiet, they will experience peace and happiness. But if your mind is in a state of aggression, no matter where your body is--no matter how secluded or solitary the place--turmoil will always be present. For example, some animals are always by themselves, alone in the quiet of nature, yet they have a burning sense of aggression because they fear they will be killed and eaten or they think they are going to catch something themselves. Being in solitude is not going to help them experience calmness and gentleness. We must have the understanding that the most important thing to do is the practice; that we need to work toward the integration of what we hear and understand, and sincerely put both into practice. Of particular importance is the practice of Sending and Receiving: With the out breath, we send out all goodness and happiness, every possible goodness that we embody, toward all beings, so that everyone may experience goodness and happiness. With the incoming breath, we take in the negativities of all beings, all confusion, suffering, and neurotic patterns. Doing the Sending and Receiving practice in this way, both formally and informally, is very important. After doing the practice .of loving-kindness and compassion in this way for a while, the practitioner then tries to experience the true nature of the mind with nothing to let go of, nothing to receive--just the awareness of the mind, beyond any reference point. While doing formal meditation practice, training our minds with loving-kindness and compassion, we may be able to generate this attitude toward all sentient beings equally. However, in the daily course of our lives, when encountering different situations--which are sometimes more like confrontations--we may not be able to maintain the attitude of loving-kindness and compassion directed equally toward all beings. At such times, mindfulness of the practice of patience and the application of certain techniques will help us to continue generating this attitude. The next part of our discussion is concerned with how to continue to generate loving-kindness and compassion, even under adverse circumstances. Generally, it is quite easy to generate loving-kindness, compassion, and tenderness when we are in a situation of well-being, when everything is running very smoothly. The difficulty arises when someone is causing us harm. For example, if one of our friends is being abused or harmed for any reason, whether because of their class, their profession, or whatever else, we feel a sense of irresistible anger or hatred toward the perpetrators. That is the time when we should have patience. That is the time when we can and must truly practice compassion. The antidote at this time is to have patience, to be able to generate patience and gentleness. We project our neuroses in many ways. Sometimes we feel that we are in a position to defeat our opponents. In our pride or anger, we want to pay them back, "an eye for an eye," with a strong sense of revenge. Then, when we find ourselves incapable of defeating or causing harm to the other people or beings, we keep this hatred in our minds. We hold onto this hatred, thinking that at some future time we are definitely going to pay them back by causing harm to them. As practitioners on the path of sanity, trying to incorporate sanity into our lives, the key to all these situations is patience. We can use patience, as well as tremendous compassion, for beings when they are caught up in situations in which they have such negative attitudes toward others. These beings always experience negative feelings about everything they do, be it concepts or actions or situations. It is an unfortunate situation for them. Therefore, having patience, and at the same time generating compassion, is the right practice. Because of the way we have been brought up, because of the way society works, there is a strong feeling that if somebody is angry at us it is legitimate to pay them back with anger and aggression. That is in the pattern of society. As a result, you feel that it is impossible not to get angry when someone gets angry at you. The situation can be seen more clearly and simply, though, in a way that is more helpful to you and to others. For one thing, it is certain that this person, who is experiencing so much aggression and hatred, has not taken this position out of a sense of joy. Instead, he finds himself helpless in this situation, experiencing a great deal of confusion, sadness, discomfort, and disturbance. He might even beat someone, such as his friends or his children. He might pound on things or throw things around. He truly desires happiness, well-being, and comfort, and he knows very well that this is not the way to achieve those ends. These actions do not represent his true being, but suddenly this upheaval of neurosis has taken hold of him. His real being would not do this: he would know that it is not good or healthy to do this. Even if he does not know it might bring all kinds of suffering and discomfort in the future, he certainly knows it does not pay in the present situation, but he still gets caught up in such emotions. When you are able to see this, and to see from a state of openness, you should definitely be more able to extend kindness and compassion toward that person. Second, if people are projecting their hatred and neurosis toward you, you can be certain this is a karmic situation you must experience. This is a result of what has been accumulating--the harm and confusion you have caused other beings, or perhaps this particular being, in the past. Due to this conditioning, these are experiences you must have. The people or beings are not angry and aggressive indiscriminately toward all beings; instead, this anger is being projected toward you in particular. There has to be something about you that creates or stimulates this reaction. There has to be something negative about you, so your attitude should be that this is a situation you have to go through because of your karmic accumulations. Having created such projections in the past, you now have to go through the samsaric patterns resulting from them, and now that you have become the object of these negativities, further samsaric suffering could be inflicted upon other people in the future if you do not act appropriately. Therefore, a tremendous sense of sympathy toward yourself, as well as others, is in order. You have sympathy for yourself because you are truly caught up in a situation of confusion and limitations. You must acknowledge that this is so, and that therefore you are responsible for what is coming to you, so you go through it with a sense of patience. Understanding that in the past you have caused harm toward other beings, you see that the result is that you are again on the way to causing more harm and more confusion to others. This cycle must stop; it must not be carried on any further. Third, the past negative accumulations you have collected are born in a body full of defects, full of weaknesses and limitations. Your body is subject to all kinds of vulnerability that you may view as harmful and as threats of harm. In reality, no one is actually threatening you. However, you may feel you are the subject of threats or suffering because of the limitations of your body. If you were not subject to the pain of your body, there would be nothing to cause such pain. By analogy, if you hold a piece of rotten meat in your hand, all sorts of worms and maggots will be attracted to it. The more you try to get rid of the worms, the more attracted they are. You may get very frustrated because you cannot get rid of the piece of rotten meat. But if you were able to throw away this meat, you would not have to go through the frustration. This is because no one is forcing you to hold onto the rotten meat. Similarly, nobody is projecting aggression onto you. It is simply that your previous actions have put you in your present position where you are subject to this aggression. Had you obtained a better birth, had you not been so caught up in samsaric patterns, you would not have become the object of these limitations and suffering. It is you who is to be blamed, not for the sake of blaming, but because this is the rational explanation for your situation. When somebody says something to you, if you do not have the limitation of feeling pain, then you will not go through the projections and sense of defensiveness associated with that experience. Therefore, whatever problems result from your circumstances, you must go through the sufferings involved. Other beings are not to be blamed. Similarly, when other beings go through such projections and all the pain associated with them, you must have patience and extend kindness toward them and toward all beings. Another way to look at the situation is that one of the most efficient and powerful ways of attaining enlightenment is by practicing patience. If nobody is bothering you, there is no occasion to practice patience. Therefore, in Buddhist philosophy and teaching, it is said that even your enemies are to be seen as your most helpful friends. You should be most grateful to them because they have given you the best opportunity to practice patience. This is simply the instruction for the highest forms of practice, given in a clear and naked way so you may have a simple, direct relationship to them. Shakyamuni Buddha attained the perfect state of enlightenment in a very short period of time. Having reached the state of complete enlightenment, his activity--which brought about all-pervasive benefit for beings--was also the practice of patience. Life after life, time after time, with beings such as Devadatta trying to evoke anger, impatience, and all other kinds of neurosis in him--and this was very challenging, even for him--he had the commitment to go beyond such reactions. Thus, it is definitely true that our enemies are in fact our best friends. We should be grateful to them all the time because our "real friends" are not able to create that kind of situation for us. Therefore patience, compassion, and love are the keys toward our attainment of enlightenment. When these situations are provided by our enemies, or by the beings that we find difficult to work with, we can see these beings as bodhisattva emanations coming to us to give the highest instructions. In a sense, this is the heart of the instruction, because it is definitely going to cause enlightenment. Since we are to work for the benefit and enlightenment of all beings, how better to repay our debt to beings than with gratitude, compassion, and loving-kindness? This is all the more so because of the benefit these beings are causing: they are giving you the opportunity, not only to attain enlightenment, but also to benefit all beings. If you are afflicted by disease and a prominent physician comes, bringing the most modern and effective medical treatments, it would be incredibly foolish to try to get rid of him or to try to kill him. On the contrary, you should extend the warmest of welcomes toward him. If you train your mind with this understanding, you will find you have reason to be compassionate, and you can become truly gentle and kind. On the other hand, if you just think, "If I am faced with such situations, I will try to practice compassion at that time," it might be very difficult to actually do so. Now that you have seen how sane and important such training is, the healthiest approach is to become familiar with the methods involved and to train yourself with them again and again. Another way of looking at it is that the particular being who is causing you harm or projecting hatred toward you may have been your parent in a former lifetime. Perhaps that being has been of great benefit to you in the past, and will be in the future as well, but right now, in this lifetime, he or she is caught up in an insane situation. Maybe you are in a better position than that person to see the situation openly and, therefore, to benefit the person out of a sense of gratitude. You owe that person something from the past, and you might also owe him or her something again in the future. You now have the opportunity to do something to repay that debt or, at the very least, not to cause any further stimulation of negative feelings. The being who is bothering you actually can be viewed as your child, or as a friend whom you always loved and shared kindness with and who suddenly became completely insane as a result of some sort of intoxication or drug or sickness. In this insanity, this person started pouring all of his negativities onto you. When there was a normal exchange of love, kindness, and tenderness between you, the negativities were not there. But now, because the situation is not something the person wanted to create, you would naturally feel a greater sense of love for them, because you know them so well and you are sympathetic. He or she does not really mean to be rude, but is unfortunately caught up in this position. Your feeling for this person would therefore be very real and very sincere. There is no difference between that kind of feeling, which you would extend toward your friend or your child, and the kind of feeling you might be able to develop for anyone who causes you harm or difficulty. On a more advanced level, this situation can be seen as being, in essence, dreamlike. In reality, no one is causing anyone harm. There is actually no harm to be caused. It is like a reflection in the mirror. Therefore, it is not going to cause any harm, and there is no true intention of causing harm. This situation, which appears to involve the causing of harm and having to be subjected to it, is in its true nature unoriginated; it is unborn within the nature of the situation. On this more ultimate level, it can be seen that everything exists only in passing. Things that appear only do so moment by moment, and nothing is truly fixed, or substantial, or creating a real obstacle. It is important to practice patience through the understanding of impermanence, along with the fact that there is a definite upheaval of our own neuroses. For example, you may have the experience of wanting to cause harm to, or even kill, certain beings. At such times, perhaps you can realize how stupid it is to get into that neurotic state of mind. Why go through all the effort of such emotions when it is already definite that beings are going to die anyway, whether or not you make the extra effort of wanting to kill them. It is ridiculous and very stupid to see yourself as living a long life and another person as about to die; it is a very confused projection. In fact, you are going through all kinds of suffering, and the other person is going through all kinds of confusion. Why put your effort into creating even more harm when beings already are going through constant harm, suffering, and confusion? Instead, when the upheaval of discursive thoughts arises in your mind (such as wanting to harm beings), a different series of thoughts will be more beneficial. First, realize that this being is going through all kinds of suffering and confusion. Second, understand that whatever anger or aggression this being has projected will cause him or her to go through further sufferings. How could you add to that? To strengthen your attitude that no more harm should be inflicted, you should work on developing the attitude of patience, together with the realization that this being is helping you to practice. Therefore, you should feel grateful to this person and try to help them. The most essential and primary point in the mahayana approach is that, by entering the Buddha's path, we have made a courageous commitment by promising to work for the benefit of all beings and to reduce the harm we cause to them. Not only have we made the commitment to benefit all sentient beings, but we have even promised that we will get to the point where we will cause no more harm to beings at all. We must be inwardly sincere in this, honestly trusting in our ability and believing it is possible to go through such development. We must be honest with ourselves in believing that we are going to do something, in understanding that this commitment is sane and healthy and that we are going to live up to it. Therefore, we take on the commitment with a vow. With that commitment, we have to maintain a certain standard of dignity. We have to live up to it for the sake of so many friends who have done the same thing, or who are now trying to do so. 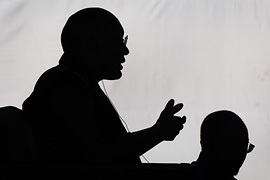 Having taken these vows and promised to live up to the goal of a sane, wholesome, and dignified life and to benefit all, we must try to support our friends and never disgrace them in any way. If we reject even one person or one being, it would be a disgrace--a great defeat to our friends as well as to ourselves. 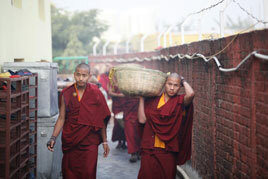 This is because we have taken it upon ourselves to work on behalf of all sentient beings. We have committed ourselves by saying that we are going to work for their benefit, so we must continually remind ourselves of the sincere commitment we have taken upon ourselves--of the kindness that this commitment requires, and of how sincerely we must respect it. Therefore, when someone seems to be your enemy, maybe you should have this attitude: having taken on this commitment to benefit all beings, this particular person should be the foremost of your disciples, the foremost of the beings you should help. It is as if you have an assemblage of disciples, and the weaker ones must be given more attention. In the same way, sentient beings are going through all kinds of situations, but this particular being must be attended to first. Even if we cannot keep all of these different points in our minds at once, at least we can be mindful of just one of them. We can remind ourselves to be mindful, not just in a formal context, but by declaring it throughout our daily lives. It is possible to have patience, and it is possible not to pay back harmful things to others. It is worth repeating that if you do not actively maintain this mindfulness, it is just empty words to say, "If someone does something to me, then I will have compassion at that time." In that case, it will be very difficult, so it is most important to have patience toward all other beings and to accept that all beings are your friends. Your enemies can indeed be your friends, and the practice of patience is a very compassionate practice whether directed toward others or toward yourself. Thus, in practicing the Dharma, there is a tremendous need to develop kindness and compassion through the practice of patience. It is not always pleasant or easy to do this, so the practice of patience itself requires patience! Sometimes it can be terribly disappointing because it is so different from what we are used to. It does not fit with the demands made upon us by the society we live in, nor does it fit with the concepts and attitudes of the people around us. For example, having to sit for hours just listening to someone (such as when receiving teachings) is not necessarily very entertaining. Therefore, we need to develop patience and compassion toward ourselves in this situation. Meditation practice is not always blissful, yet we need to do it, so we need to be compassionate and patient toward ourselves while practicing. If you are trying to work with various situations and people from the point of view of the practice, people will not always understand what you are doing, and often you will not be able to communicate it clearly to them, which can also be quite difficult and disappointing. There can be the feeling of loneliness as well, of being very much on your own in the practice. In all these situations, patience is very important. It is not very easy to be compassionate and patient toward yourself, as you would be toward a person who is having major surgery--someone who is very sick and going through all kinds of pain. Yet you might be able to happily and willingly go through a surgical operation despite the pain, because you know where it is going to lead. Knowing why you are going through this extra pain, when you had already experienced a great deal of pain, you would be patient enough to go through with it, no matter which part of your body had to be opened up. In the teachings, it is said that we have to be warriors, victorious warriors. We must declare that we are victorious warriors--and we definitely are, we must be. Someone who has killed thousands of people may claim to be very brave and victorious, but to what avail? Still this person claims to be a brave and victorious warrior. Samsara is vast and filled with beings caught up in confusion and selfish pursuits, and yet this is not discouraging for a real practitioner. He or she is able to say that even if every situation they face is a barrier in their path, nonetheless, they will continue to work for the benefit of beings. Such a stance is not stupid; it is a very courageous and warrior-like position in which we can be victorious, both inwardly and in relation to others. Therefore, the practice of patience is essential. 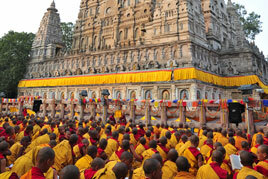 Doing the practice of the Dharma is a virtuous action, and through it, virtuous attitudes are being practiced. If you have the goal of being born into a noble family in your future life, surrounded by wealth and luxury and by many beautiful forms, it is possible that this aim might be fulfilled because of the effect of the practice. But one moment of aggression could completely throw you off balance and destroy whatever accumulation you have made. From this point of view, it is also very important to practice compassion and patience. Practicing patience means practicing compassion and loving-kindness toward all beings. If you are practicing compassion and loving kindness toward beings, there is no need for you to aspire to be born in a noble or influential family. You will simply be born into that situation, and as a result, you will be able to benefit beings. It is like the continuation of a greater and greater project. This is the situation with an incarnate bodhisattva who is born into a beautiful home in a beautiful setting: it does not happen out of attachment. An incarnate bodhisattva who wants to be born into a particular situation or a particular family is just born there. It is like the shade of a huge tree, which is just naturally there. There is no need to put any extra work into creating the shade. Whatever viewpoint you take on the practice of loving-kindness and compassion, the practice of patience is most important. There is not any doubt about it. The future buddha, Maitreya Buddha, will be born in a unique form. He will be tall and handsome, uniquely beautiful, with everyone looking up to him and asking, "Why?, How?" The truth of the matter is that he will be born in such a human form out of kindness. Because of the unique way he will appear, he will be able to benefit many human beings, and his appearance will indeed be due to his love and kindness. During this particular time in which we have been born, with the situations we experience right now in the world, there is an immense need for the practice of compassion and loving-kindness. A great deal of destruction and confusion is taking place everywhere in the name of living beings, which indicates a lack of sanity, of patience, and of kindness and compassion. 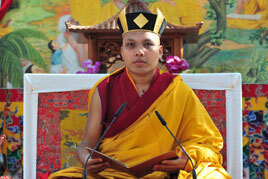 It also reminds us every moment that as practitioners of the Dharma we have to be very sincere. Every day we get reminders from so many different things: from daily news stories and from the criticism, blasphemy, emotional turmoil, paranoia, and frustration going on around us. As an analogy, it is said that people who are blind will never be able to appreciate the beauty of form--of the distinction between different things. This is really a pity. We empathize with them and generate compassion toward them because they are in such an unfortunate situation. Similarly, people who are blind to the right view are also in an unfortunate situation and deserve our compassion. They cause more harm to themselves than to other people, because they do not understand the nature of their wrong view or the way in which their words and attitudes are misinformed and their actions misguided. Unfortunately, such beings often think the solution is another wrong view, another confrontation, or more violence. They might insist that you are being cowardly if you say that fighting back is no solution. Such things happen in politics and many other worldly situations all the time. As practitioners of the Dharma and followers of the Buddha's path, developing the attitude that we have been talking about toward our practice and ourselves--toward each other and toward all sentient beings--is most important at all times. 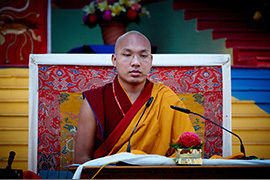 To conclude this teaching, it is appropriate to take the attitude of dedicating the merit of this discussion on loving-kindness and compassion and on the Sending and Receiving practice. 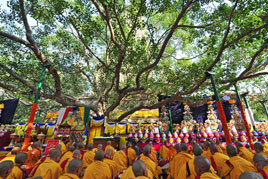 In addition, all meritorious accumulations everyone has made from beginningless time, we dedicate to all beings, particularly for the benefit of those beings who are caught up in war and hatred. May these beings awaken from such a situation of insanity. 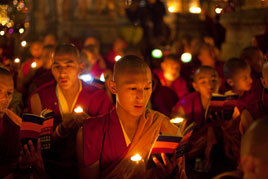 May the benefit of our dedication extend to all beings in the six realms, that they may experience total liberation. 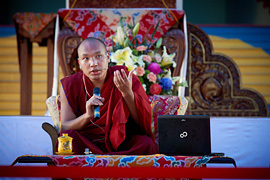 Taken from a transcript of a teaching given by Khenpo Karthar Rinpoche at Karma Triyana Dharmachakra. The transcript is available in its entirety from Namse Bangdzo Bookstore.